No, you can’t put the leopard in the sandwich, look what happened to the last guy who tried that. Is the skeleton supposed to be wearing short pants? If so, where did the rest of its clothes go? Did the gent on the right take them and put them on? Put them in his sandwich? Aha! There is one crow on each side of the gent. This means he is obviously the all-father Heinlein! Doesn’t explain where the rest of his legs went though. Maybe the Leopard got hungry and had a snack? Is that leopard part basset hound? One more case for a shortened legs tag. This being BAEN, what are the odds the leopard is staring at a scantily clad large breasted blonde who is packing either serious firepower or a pastrami sandwich? First off, I would like an answer as to why this city apparently just leaves the dead where they died, without bothering to move them. Especially given this city’s apparent policy of giving the dead shorts to preserve their modesty. Second: That guy is remarkably undisturbed about eating next to a dead person. And whose leopard is that? Not quite what Oscar Wilde was on about when he discussed feasting with panthers. A Telempath, a Communipath, a Psionic Menace and an Angry Esper walk into a bar. Guy tells guy to kill guy. Guy goes to kill guy. Guy tells guy to kill first guy. Guy kills first guy. New guy goes to get guy for killing guy. Bunch of guys try to kill guy. Guy gets guys to not kill each other, especially him. Guy isn’t dead. Re: bodies left in city streets – during Christmas and New Year of 1979/80 this pretty much happened in Britain thanks to local government unions striking including morgue attendants and municipal grave diggers. Dude, keeping a wild animal inside city limits isn’t legal either. @Ray P. (10): Yes, and Russian soldiers with snow on their boots came by train. @Tat I was there in 1979. I guess I’ll trust my memory. thanks. @Ray P. I was there too. It didn’t seem that way on our patch. Things were a lot worse a year later, so I stopped believing the papers. 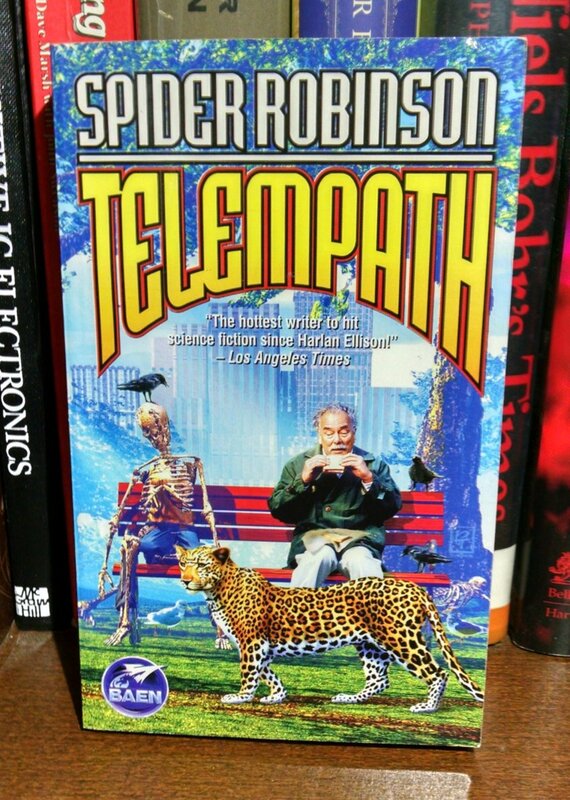 Spotted a MAJOR typo: somebody accidentally put an ‘m’ in the middle of ‘telepath’!!! @Ray P, @Tat Wood—I can’t speak for you gents, but in 1979 New York, it was noteworthy not to see a dead guy on a park bench. I’ll bet Ellison wrote that blurb. “That man didn’t have a lunch sandwich. He was eaten by wild animals. But thanks to the A Sandwich For Every Lardass Foundation, THIS man won’t have to suffer the same fate. Because he can toss the animals a sandwich and escape certain doom. Ray… during the strike it was sacks of trash left in the streets. In the story, about everyone in New York (and everywhere else) died of shock the night the Hyperosmic Plague was released and destroyed the other virus that everyone has which suppresses our sense of smell. Except for that guy who is on the cover, evidently. This is in the book. As background. Including the guy. He isn’t the protagonist. The protagonist is black. I don’t remember about the big cat but presumably it is a survivor from the city zoo. The dead guy in just shorts, I forget, maybe it was a nice summer day when the end came. Or he died fighting his own stinky T-shirt. Or the old guy, who hangs out in the university, borrowed and dressed the skeleton, and maybe a poorly stuffed cheetah, from the biology building, to pose in the picture. Maybe an editor insisted the artist must go back and paint pants onto the skeleton. TRIVIA: the sandwich went on to have a small role in My Big Fat Greek Wedding.